The traditional "Procession of Witness" has long been celebrated throughout the North West. For many, Whit Friday remains the most important date in the calendar. In 1849, Charlotte Bront� described the Whitsuntide walks as "a joyous scene, and a scene to do good." Her novel Shirley contains a vivid description of the event in West Yorkshire. Until relatively recent times, Saddleworth was part of the West Riding of Yorkshire but the tradition persisted throughout the North West. Each church or chapel marches in procession through the streets. The local bands would of course lead the processions but many churches hired bands from afar. Bands would arrive from throughout Yorkshire and the North West, playing as they marched from the station. Each procession starts from the local school, the band in the lead ahead of the church banner. Then come the church dignatories, assorted choirs and scout or guide troops. Finally the local families, the boys in their best suits and the girls all in white - this is the annual occasion for new clothes The procession marches to a church service on the market ground usually starting with "Hail Smilin’ Morn" before going around the parish. The contests began as a sequel to the afternoon festivities. Sadly, most of these walks have now transferred to the preceding Whit Sunday but Saddleworth and Mossley still walk on Whit Friday morning. Dobcross is the one village that seeks to stay faithful to all the traditional Whit Friday activities, of which the band contest is just a part. Details, including times for the Dobcross Whit Walk are included in the Dobcross venue details. Road closures for the Whit Walks on the the morning of Whit Friday are detailed here. The Manchester City Council web-site contains a number of interesting images of the Whit walks from the Manchester Archives & Local Studies records. The British Pathe News web-site has some splendid archive footage of the Manchester Whit Walks from 1914 to 1939. (You'll have to imagine the sound on these.) For an interesting history (including sections on the Oldham, Saddleworth and Tameside Whit walks), see "The History and Memories of the Whit Walks - In and Around Manchester - With banners and Bands" by Canon Jim Burns (ISBN 978 1 906832 84 9 published 2013 by Countryvise Ltd). Recently published is the first book on the history of the Whit Walks in and around Manchester. 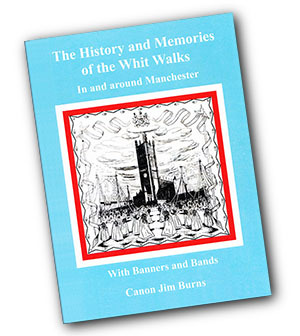 Written by Canon Jim Burns, "The History and Memories of the Whit Walks - In and Around Manchester - With Banners and Bands" has sections covering the Oldham, Saddleworth and Tameside walks. The book contains lots of personal accounts and is well illustrated with photos. Published 2013 by Countryvise Ltd.